This morning, Microsoft announced the preview of a new business video platform called Microsoft Stream. Geared towards business communication, Stream builds upon the learnings of Office 365 Video, and over time the two experiences will converge, making Stream the de facto video experience in Office 365. I got to see a demo of the new Stream offering and overall, was quite impressed. While Stream has some limitations today, Microsoft envisions Stream as a unified communications platform and plans to add a lot more functionality, making it a true end-to-end enterprise video platform. Anyone with a business email can sign up today and use Stream for free to upload, share, discover, tag, secure and playback their video. Microsoft isn’t saying when they plan to start charging for Stream, or what it will cost, but did say they will always have a version of Stream that remains free. The company told me they will give out more details on different pricing packages by the end of the year. Deliver corporate broadcast seamlessly: Increasingly the way organizations are communicating and connecting is through live video. 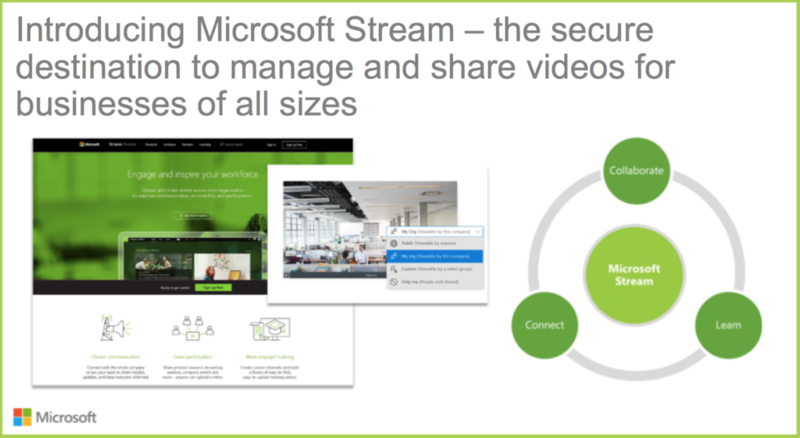 We believe that Microsoft Stream portal should be the destination for both live and video on demand. Intelligent video search: We believe true power of video will be realized once we are able to search within the video. Leveraging capabilities such as audio transcription and face detection, we can enable deep search, empowering employees to find relevant content faster. Make video part of your business apps and workflows: With the ability to integrate Microsoft Stream with other business apps like PowerApps, Microsoft Flow, SharePoint and other line of business applications, we see great opportunity to leverage the richness of video across apps. IT management capabilities: We recognize the critical role IT plays in managing content and user access to internal content. We plan to enable IT to manage access and settings like granting and assigning channel and video access, remove and monitor content and manage what is viewable to specific groups in the organization. Microsoft Stream App Ecosystem: We believe our partners will take Microsoft Stream experiences to the next level. Using Microsoft Stream APIs, partners will be able to create custom applications and make them available in AppSource, Microsoft’s marketplace for business applications we announced earlier this month. While Microsoft hasn’t said the timing on when these new features will be coming to the market, customers will also be able to automate business workflows through Microsoft Stream’s planned integration with Microsoft Flow, a business application to automate workflows among customer’s favorite apps and services. So we can expect to see Stream turn into quite a robust enterprise video platform over time, with a lot of functionality. And by tying Stream into Microsoft’s cloud services, especially Azure Media Services, which lets you ingest and encode live video, it’s clear that Microsoft wants Stream to become the standard platform enterprises use for both live and on-demand video. You can see a marketing video of the platform here.